The Pines Bridge Program supports the philosophy that all children can learn. Our staff recognizes and honors the unique abilities and learning styles of each individual and strives to provide appropriate opportunities for every student to develop cognitively, socially, emotionally, and physically. In close partnership with the family, the goal is to challenge all students to reach their maximum potential and level of independence. The Putnam | Northern Westchester BOCES Pines Bridge Program serves students between the ages of 5 and 21 who have multiple disabilities. The intensive staff to student ratio (12:1:4) allows for a wide variety of learning environments to be provided in order to meet the cognitive, sensory, physical, emotional, vocational, and social needs of the students. Each student is challenged daily to reach his/her maximum potential and level of functional independence. The Pines Bridge Program uses the Unique Learning System. Unique is a Common Core Standard-based curriculum program designed specifically for students with significant disabilities. Additionally, the Pines Bridge Program follows a Common Core aligned curriculum that teaches students essential skills needed to better access their environment, participate more fully in instruction, and communicate their needs. This curriculum is used to identify specific skills that need to be targeted in order to meet the needs of each individual student. Mobility Opportunities Via Education (MOVE®) is a curriculum designed to help students with disabilities learn the skills needed for sitting, standing, and walking. 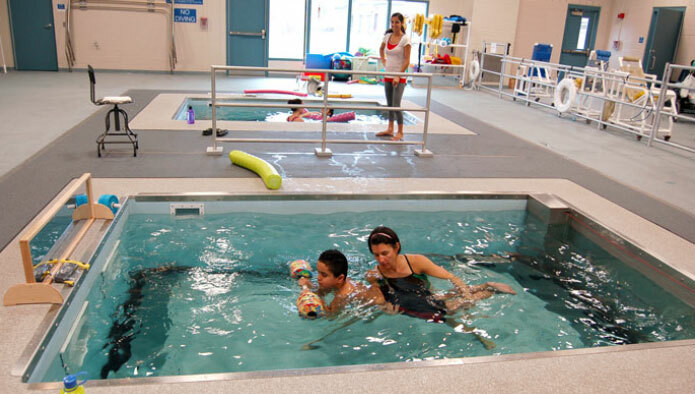 It is a collaborative program that uses the services and knowledge of parents, educators, therapists, and support personnel to help students learn and practice skills while engaged in functional activities. Pines Bridge School was named a model site of MOVE® International on May 31, 2002. The Transitions Program is designed to provide secondary-aged students (16-21) with experiences to prepare them for the transition from the educational setting to an active and productive adult life. On-site job training, volunteer work, and experiences with the life skills required as a part of daily living are incorporated into this program. Putnam | Northern Westchester BOCES and the Sunshine Children’s Home and Rehab Center are pleased to share a new student program, Pines Bridge School at the Sunshine Children’s Home. Program Rationale: The population of Sunshine Children’s Home and Rehab Center includes school-age children who are too medically fragile to travel to Pines Bridge School on the PNW BOCES campus. In response to an unmet need for educational services for these students, a unique partnership was formed, establishing the Pines Bridge School at Sunshine Children’s Home. This program enables students with unique care needs to participate in a full-day school program under the medically supervised care of Sunshine’s clinical team – physicians, nurse practitioners, nurses and respiratory therapists. This program is designed for students who are ventilator dependent, receiving IV infusions and/or have other high-tech care needs. Pines Bridge School at Sunshine is a self-contained, highly individualized program for students with multiple disabilities. The 12:1:4 program integrates cognitive, sensory, physical, emotional and social learning for students. Individualized programs focus on achieving IEP goals and accessing the NYS Common Core Standards as aligned to the NYS Alternate Assessment. Enrichment programs are integrated as appropriate and available. Related services, including PT, OT, ST, Vision and Hearing are provided by skilled therapists, per each student IEP, throughout the school day. Staff: Pines Bridge School at Sunshine is supervised by the Pines Bridge Principal, and staffed with one special education teacher, one teaching assistant, and up to four teacher aides per class. The classroom staff is supplemented by providers of enrichment activities such as art, music, and physical education. Benefits: The opportunity for parents to send their medically-involved child to a full-day, academically driven, medically supervised school program is tremendously gratifying. School districts have the ability to extend their continuum of services to the most medically fragile students and ensure that they have a high quality education while under excellent medical supervision.